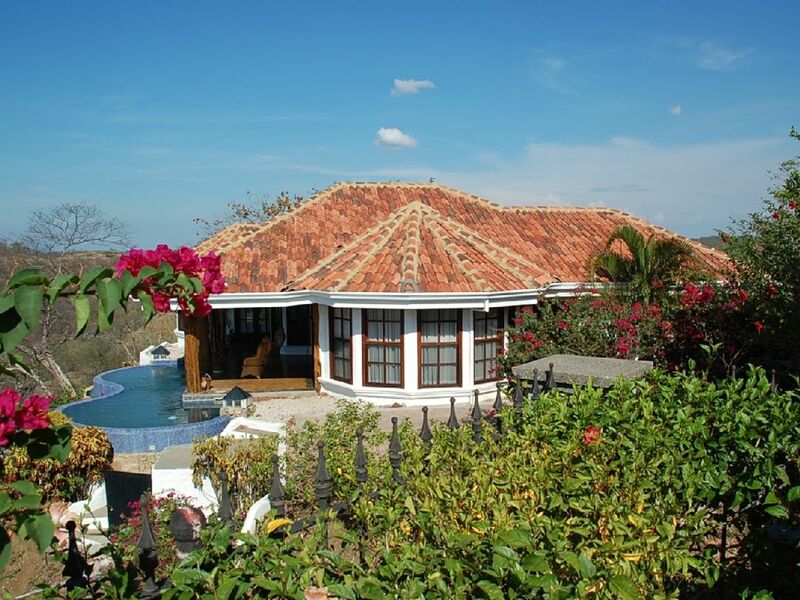 Located in Playa Hermosa; Guanacaste, within the community of Monte Paraiso and behind the private walls of the Casa Cole Compound you will find Casita Cole. This 1200 Sq Ft, 2 bedroom, 2 bath wonder of classic Costa Rican Design will absolutely charm her guest with her thoughtful and unique amenities. The bedrooms and baths are very spacious. A large living room separates the two ensuite bedrooms and adds to the feeling spaciousness. There is nothing small about the casita. There is a fully equipped kitchen ready to assist you in preparing any meals. Just outside awaits your private pool with the most superb views of the Gulf of Papagayo and Ricon de la Vieja National Park. The views will be vibrantly etched in your memory, tantalizing your desire to return to "Pura Vida".that will have you reminiscing about the sunsets for years to come. Upon entering the private gates of Casa Cole you turn off onto your own private drive to the casita. Privately gated 3/4 acre property within a gorgeous secure community with 24 hour security. Meticulously landscaped private gardens Located a mere 20 minutes drive from the Liberia Airport the casita is cozy when it comes to location and amenities. In just seconds you are on one of Costa Rica's most beautiful 'Blue Flag' beaches. Every conceivable water activity is at your doorstep. 20 minutes from the Liberia International Airport 15 minutes from the Cima Private Hospital Three national parks are within a one hour drive; rainforests, volcanoes,wildlife refuge, secluded beaches and hidden waterfalls will keep your days full of activities. Restaurants,bars and casinos will occupy your nights. Playa Hermosa has long been known as one of the most prestigious beach communities on the Gulf of Papagayo. Located with a gated community with 24 hours security. Property is also a gated oasis. Lovely, quaint cottage, private from the main home with a cheerful kitchen overlooking the mountain. The great room has splendid views of the Pacific and Peninsula Papagayo. Located only 20 minutes from Liberia International Airport, this property is well situated for those seeking adventure while appreciating the pleasure and convenience of luxury accommodations. Minutes off our beach is arguably the best deep-sea fishing in the world, Witch's Rock's renowned waves are 25 min away by boat, Experience the local fishing village of Playas del Coco with local handicrafts and a multitude of bars and restaurants. Liberia (30 min.) Brilliant hiking, hot springs,mud holes, waterfalls, remote beaches and more .We are an hour’s drive from Santa Rosa National Park and Rincon De La Vieja National Park. Tropical scenery and gorgeous views abound in Costa Rica. A drive east takes you to Monteverde's Cloud Forests and Vulcan de Arenal in just in 2.5 hrs. The home was a fantastic choice for us. Nestled on top of a hill overseeing Playa Hermosa, we had a great, unobstructed view north of the city. The sunset is off to the left behind the neighboring hills. Quiet, secure, spacious, and beautiful. The casita was clean, had comfy beds, and a well stocked kitchen! The views from the casita are breathtaking. It's not walking distance to the beach, but we had a car. The pool was clean and the water was refreshing. Bring your own bags to the supermarket (we bought some reusable bags and donated to the casita.) Don't bother with the TV in the living room, it's too small to see from the sofa and the speakers are blown anyway. But with so much to do and see in Guanacaste, there was no need for the TV for our stay. There are plenty of fluffy towels for bathing, swimming and for the beach. Having a washer/dryer (with a decent supply of detergent) was very convenient. Pack light. Pura Vida! We will be back. Overall a great vacation spot. The location in Playa Hermosa is bar none. The house is in a small gated community with guard at the gate. The home itself is very inviting with a magnificent view from the back porch. The bed was very comfortable, the entire place was super clean, wifi worked great, the home was fully stocked. Milena, the house manager was excellent and was available by phone if we needed anything. Check in and check out was a breeze. Highly recommend. The casita is lovely, the view is spectacular and the AC works. My wife has been daily coating herself with OFF. Baking soda in the evenings on all the bites. I do not know if it is the area or the Casita, but each morning she awakes with more insect bites. She was ready to go home on day 2. Thanks for staying with us. Glad you thought the casita was to your liking. Sorry to hear about the insect bites - that is one of the downsides of living in a tropical environment :( - We have no see'ems here and they tend to bite and get itchy the next day. Off unfortunately does not work that well with no see'ems. The off lotion does work better than the spray. I hope you still enjoyed our lovely country. Management company was super easy to work with!! A sweet little casita for our four day stay. Secure and at the top of the mountain with an incredible view. We loved the covered deck to sit under and enjoy a meal and the view. The beautiful master suite and view was lovely, and the bed was heavenly comfortable. Kitchen is well stocked with most items and lots of the basic essentials, spices, etc. An abundance of fluffy new bath and pool towels were available. Casita pool is small and about three feet deep but big enough to cool off in after a day at the beach. The pool was in need of some TLC, but we still loved our stay and would likely return! Next door the beautiful Casa Cole (parent home) with a very large beautiful pool sits adjacent just across the driveway and up some steps. Renting both for a large family get together would work very well. Rates are subject to change until booking is confirmed. Quote lifespan- 48 hours After a request payment is made travelers have 48 hours to respond until the quote expires. - 25 Minutes from the Daniel Uber International Airport (LIR) - A 7 night stay is required from Dec 16, 2017- January 3, 2018. - Guests checking in after 5PM - 9PM a $35.00 late check in fee will apply. -Guests checking in after 9PM a $50.00 late fee will apply. This fee will be collected upon check in and payable in USD or Costa Rican Colonies. -A gentle reminder that you are staying in a privately-owned home and we respectfully request that you treat it with respect, including all furnishings and linens. -All homes are smoke and pet free. Privacy from the main house is assured. You can rent this charmer by itself or in tandem with the main house property #192288. Either way you will be astounded by this fantastic home.